Sheffield United kept their slim play-off hopes alive as they beat League One title-chasers Walsall. 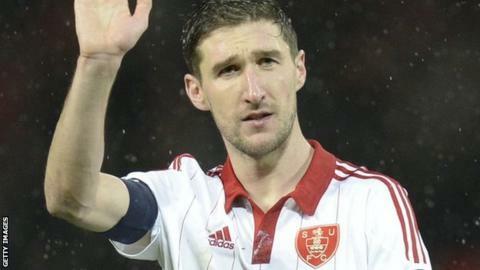 Chris Basham gave the Blades the lead when he headed Matt Done's cross past Walsall goalkeeper Neil Etheridge. United quickly doubled their advantage through a superb Billy Sharp volley after good work from Basham. Tom Bradshaw came closest for the Saddlers, but George Long was quickly off his line to smother as the Blades ended Walsall's three-game winning run. Walsall are now nine points behind League One leaders Wigan, but have two games in hand, while Sheffield United are eight points off the play-offs with six games remaining. "I'm a bit frustrated, but win or lose we don't over analyse straight after the game because emotions are quite raw so we always try and think a bit more logically. "I can't fault our effort or our application. Of course there are decisions that we think we could have made better. Individually, we'll look at each goal as well. "What we have to do now is make ourselves hard to beat next week and see if we can get the three points at Oldham." Match ends, Sheffield United 2, Walsall 0. Second Half ends, Sheffield United 2, Walsall 0. Attempt saved. Tom Bradshaw (Walsall) header from the centre of the box is saved in the top centre of the goal. Substitution, Sheffield United. Dominic Calvert-Lewin replaces Che Adams. Attempt missed. Matthew Pennington (Walsall) header from the centre of the box is too high. Corner, Walsall. Conceded by Martyn Woolford. Rico Henry (Walsall) wins a free kick in the defensive half. Substitution, Sheffield United. Martyn Woolford replaces Matt Done. Corner, Walsall. Conceded by Ryan Flynn. Attempt blocked. Anthony Forde (Walsall) right footed shot from long range on the left is blocked. Jay McEveley (Sheffield United) is shown the yellow card for a bad foul. Jordy Hiwula-Mayifuila (Walsall) wins a free kick in the defensive half. Substitution, Walsall. Milan Lalkovic replaces Sam Mantom. Substitution, Walsall. Anthony Forde replaces Andy Taylor. Corner, Walsall. Conceded by Dean Hammond. Matthew Pennington (Walsall) is shown the yellow card for a bad foul. Foul by Matthew Pennington (Walsall). Attempt saved. Adam Chambers (Walsall) right footed shot from outside the box is saved in the centre of the goal.